After much research, it became apparent to us that anyone serious about juicing will want to invest in a cold press juicer. We spent hours trawling the internet to find the best cold press juicers at the best deals so you don’t have to! ​Read on to find out which products we recommend as the best of the b​​est. A cold press juicer (also known as a masticating or triturating juicer) has a unique way of extracting the juice from fruit and vegetables. Unlike other models on the market, cold press juicers extract juice by first crushing the fruit or vegetables and then pressing them. This method of extraction produces a high yield, high nutrition juice. By looking at the table above, you may well have narrowed your selection down to a few options. Read on for a more in depth review of each of the cold press juicers to make sure you truly are choosing the best one for you. 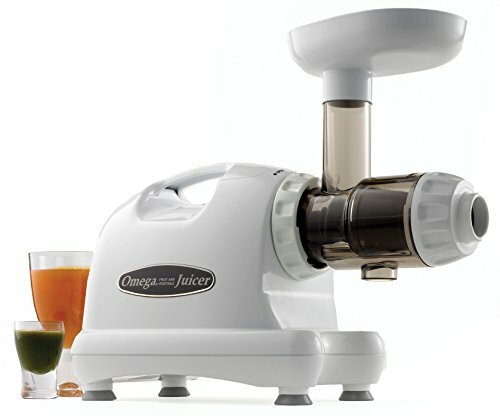 The Omega J8006 Nutrition Centre juicer came out as the best of the best. This juicer is ideal for all kinds of fruit and vegetables. 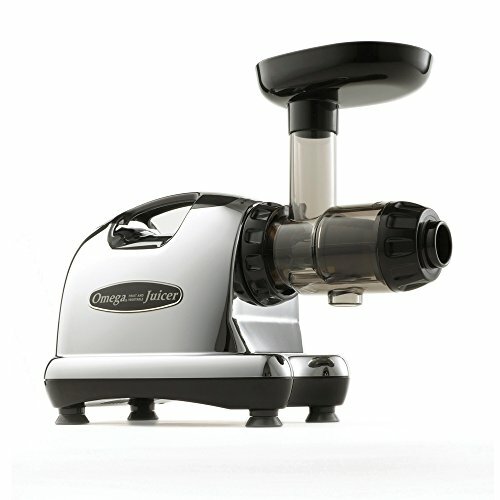 Described as an easy to use masticating juicer with a powerful motor (the motor is equivalent to a two horse power engine), the Omega J8006 promises a higher yield from less produce and guarantees to reduce foam and froth which prevents oxidation and means the juice can be stored for up to 72 hours. This juicer is perfect for anyone who wants a juicer that can do more than just juice – with seven features on top of the juicing capabilities; this is a great all-rounder that can make your life so much easier. Ideal for busy, on the go families who want a fast and healthy solution. The Omega J8004 came a very close second. It comes with plenty of accessories for multi-feature use. The Omega J8004 Juicer ensures that the maximum nutritional value is left in the juice – not in the pulp. It guarantees a compete mastication process that results in great juice and very dry pulp. It features an auto pulp extraction feature meaning your juicing is a continuous process. This juicer is ideal for large families who all want to juice together. The easy clean machine is simple to use and as a commercial juicer, produces a larger volume of juice in one go. Pretty impressive huh? 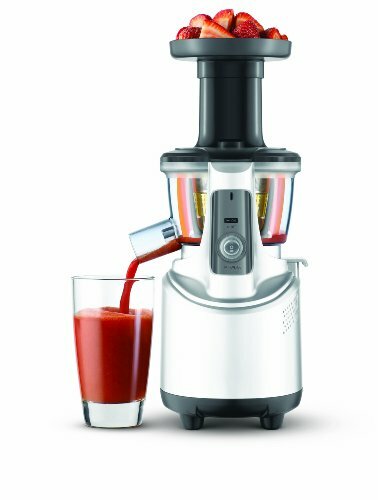 Combined with an rpm of only 47, the Tribest Slowstar is the king of slow juicing harder, more fibrous fruits and vegetables like carrots and celery which can sometimes be problematic. The impressive torque not only prevents jamming, it also reduces stress on the machine, making it a better choice for longer lasting parts. It also reduces the time taken to make the juice by up to three times. This machine is ideal for you if you want the best engine and best technical process. New sleek design that complements any modern kitchen style and design. The Tribest Green Star Elite GSE-5000 is the ideal juicer for anyone who is style conscious.. The Tribest Green Star Elite isn’t just a pretty machine! It can be used to make nut butter, baby food and sorbets and of course the quality juice you would expect from this brand and this price range. 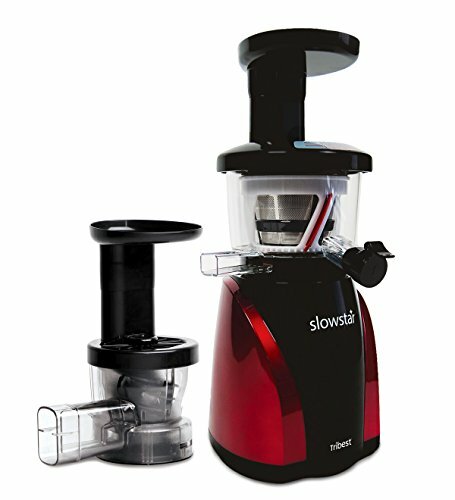 This model is ideal for on the go juicing with its sure grip handle. It also comes with a twelve-year warranty as standard. 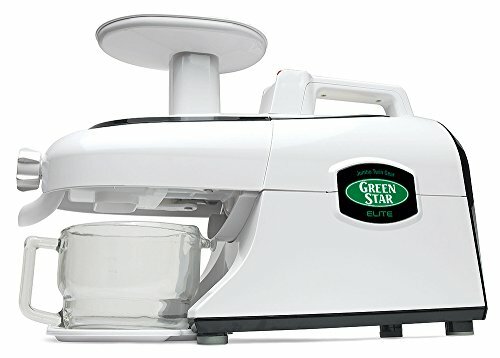 The Tribest Green Star Elite is the perfect juicer for anyone who is conscious of how a juicer will look with their kitchen décor but still wants an efficient juicer that makes good, nutritious juice. The Omega VSJ843RS is the third Omega to make it onto the list. This machine is Omega’s newest offering and the only vertical juicer to make the list. This fantastic machine runs at only 43 rpm making it one of the most efficient juicers on the market. That, combined with the auto-clean function which prevents the screen from becoming clogged ensure this machine is the most productive. The auto-clean function also makes cleaning the machine after use so much easier. With the most modern design and technology, this juicer is a winner and is ideal for anyone who appreciates contemporary design coupled with innovative technology. 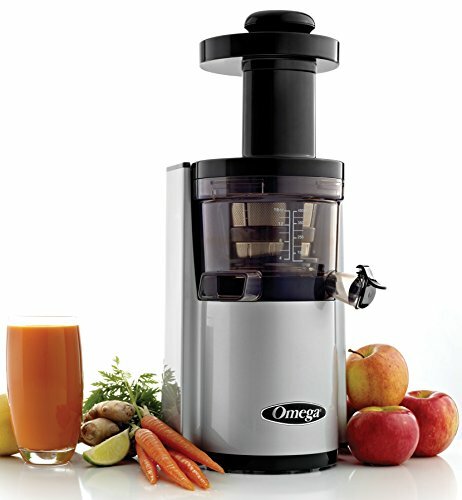 The Omega Vertical Juicing System is the newest addition to the Omega range of juicers. The improved auto-feeding design and extraction system make juicing any ingredients quick and convenient. The Kuvings NJE-3580U Masticating Slow Juicer runs at a reliable 80 rpm and promises easy assembly, disassembly and cleaning. This model also boasts an improved auto feeder design. The improved auto feeder works by automatically pulling down ingredients from the feeder, meaning you don’t have to push them down. The machine then slices the ingredients for you, meaning you save time on pre-cutting ingredients. This innovative auto-feeder system means that the Kuvings NJE-3580U Masticating Slow Juicer is the ideal machine for anyone who is pushed for time. The juice can be stored for up to 72 hours too, which can help to streamline the process by making the juice at a time that’s convenient to you. Perfect to aid a busy, healthy lifestyle. Ultra Quiet 240 Watt Motor: Powerful low speed extraction method with no heat transfer. The Breville BJS600XL Fountain Crush Masticating Slow Juicer prides itself on its super quiet operation. Combined with the quiet motor, the Breville Fountain Crush also provides forward and reverse motor functions. If the ingredients become clogged around the screw, simply stop the machine and hit the reverse button until they dislodge then re-start the process. The super quiet performance of the Breville Fountain Crush means it is an ideal choice for any early risers who like to start their day with a breakfast juice without waking up the whole house. It’s also a great machine for anyone with very young children, as the super quiet operation means you can juice while they nap! 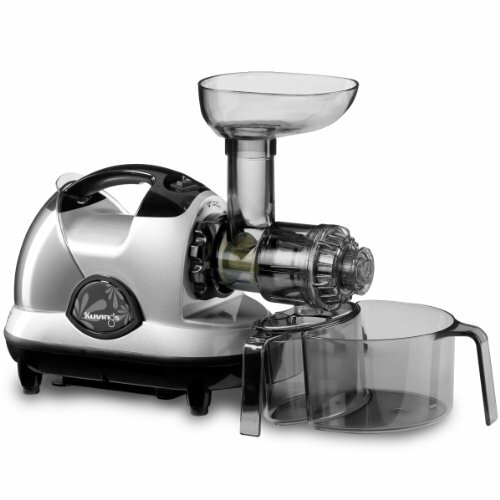 Heavy duty, high quality, long lasting juicer utilizes a 1/3 hp electric motor and stainless steel motor shaft backed by a 10 year limited warranty. The Champion Juicer is a juicer that’s built to last. The technology in this juicer includes ball bearings to the front and back making a smoother and cooler running process (which contributes to a better, more nutrient rich juice) and an unmatched starting torque, which helps to ensure the motor is running smoothly and efficiently. With a ten-year warranty, you can be confident that the Champion Juicer is an investment. The extra long warranty shows that the manufacturer is confident in their product and expects its durability to shine. Combining all the aspects you’d expect from this level of juicer, including extra accessories, with the focus on durability and an efficient working process, the Champion Juicer truly is the juicer of champions! Ideal for anyone who values high quality products that are made to last. 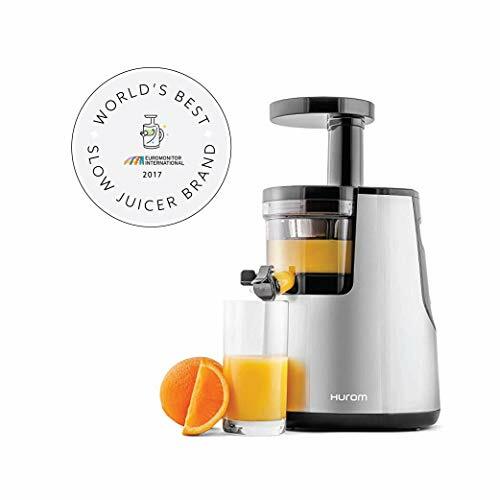 The Hurom Elite Slow Juicer is the most recent to the Hurom line. The Slow Squeezing Technology guarantees to preserve all of the nutrients and natural taste of your fruit and vegetables, including vitamin A, vitamin C, and the live enzymes, which are the parts that are often lost in less innovative technology. The juicer can be used on all kinds of fruit, vegetables, and nuts and has no problem slicing through harder ingredients. It can make juice, baby food, nut butter, milk, sauces, marinades and baby food. It’s easier to clean than previous Hurom models and has a complete safety system embedded in the technology that won’t allow the motor to run unless all of the parts are locked in place. The Hurom Elite Slow Juicer is the ideal model for anyone looking for a good value for money all rounder. How is a Cold Press Juicer Different to Other Juicers? The main difference between a cold press juicers and other juicers (i.e. a centrifugal juicer) is the technology used to make the juice. The centrifugal juicer uses a high-speed spin to squeeze the juice from fruits and vegetables, whereas the cold press juicer using technology which replicates mastication to extract the maximum juice and nutrients from your ingredients. The difference becomes apparent in the taste, quality and pulp level in your juice. Because the cold press method doesn’t generate heat, no enzymes are lost in the juicing process. This means your juice will taste fresher and sharper, and perhaps most importantly, it will be jam packed full of the nutrients and vitamins your body needs to be healthy. The benefits of a cold press juicer, when compared to a centrifugal juicer, are many. Not only are you getting a higher quality, more nutrient, better-tasting juice, but you also have the ability to do much more than just juice. The leading brands all have extra settings such as making all natural nut butter, making nutrient-rich baby food, making fresh pasta and making soy or almond milk. The technology used in the cold press juicers means that it is generally longer lasting and more durable than centrifugal juicers. They are more efficient both on power and ingredients (you get a much higher juice yield in a cold press juicer per ingredient than you do in a centrifugal juicer as the cold press process extracts more juice). They also operate more quietly. As the cold press juicer rises in popularity, the range of choice grows to the point where it can become almost overwhelming. With each model boasting extra features, and all of them claiming to be the best one available, it can be difficult to know which juicer is right for you. Of course, an important consideration is your budget. Think of a cold press juicer as a long term investment. Short term, they can run pretty expensive, but long term, they are actually very cost efficient. They last much longer than the average centrifugal juicer saving you money on repairs and replacements. They also save you money on ingredients due to the higher juice output. Another important factor is what exactly you want from your juicer. If you only want juice, it isn’t a good idea to pay extra for extra functions. If you do want a multi-purpose product, make sure the one you choose does everything you require. Once you have established your budget and what you want the cold press juicer to do, you’re a lot closer to making the decision, and you have narrowed down the field a lot. Now it’s time to concentrate on the particular product. Do you have a brand preference? If so, start there. Read articles such as this one to narrow down your options further, and once you have a short list, consider checking out customer reviews on sites like Amazon or Which (these tend to be more reliable that reviews on the product’s own website where the manufacturer has control over which reviews are shared publicly and which aren’t). In short, a cold press juicer is the right choice for you if are conscious of getting as many nutrients as you can from your juices. If you like your juice fresh and natural and you like to do cleanses and make nut butters etc., then a cold press juicer is the right juicer. You can’t go wrong with the nine juicers on our list above – there is something for everyone, ranging across different budget levels and having different strengths.